Wage: Approximately $3250 to $3500 per month based on experience and qualifications. 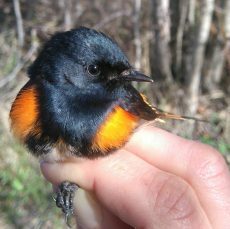 The Lesser Slave Lake Bird Observatory (LSLBO) is located in the Lesser Slave Lake Provincial Park, approximately 20km north of Slave Lake, Alberta. During our spring and fall migration monitoring programs, we operate 12 standard mist-nets and 2 aerial nets to band songbirds. In the summer, we operate 4 MAPS stations and may be performing breeding bird surveys in remote locations. We are looking for one hard-working, enthusiastic, detail-orientated individual to assist with our long-term avian monitoring programs including visual counts and bird banding. Daily duties include setting up the station early each morning, conducting visual counts, extracting and banding birds, and training and managing volunteers and assistants, as well as data recording, tabulating daily totals, completing the daily log, and data entry. Additional duties include equipment upkeep, trail maintenance, and demonstrating bird banding to the public. Experience working with mist-nets, identifying, aging, and sexing birds in the hand is required. Successful candidates may be expected to work long days, including weekends and holidays and must be flexible with schedule changes. If the candidate possesses or can obtain a permit to band Northern Saw-whet Owls using mist-nets, the contract may be extended until mid to late October. Seasonal staff accommodation is available at the Boreal Centre for Bird Conservation for $295/month.